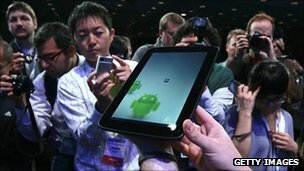 Chipmaker Intel has set up a development partnership with internet giant Google to improve its mobile phone and tablet processors that run on the Android system. The move is aimed at giving Intel greater access to one of the industry's fastest-growing segments. Intel is the world's biggest chipmaker in the computer and server market. However, it has not been as successful when trying to create smaller, more power-efficient chips.